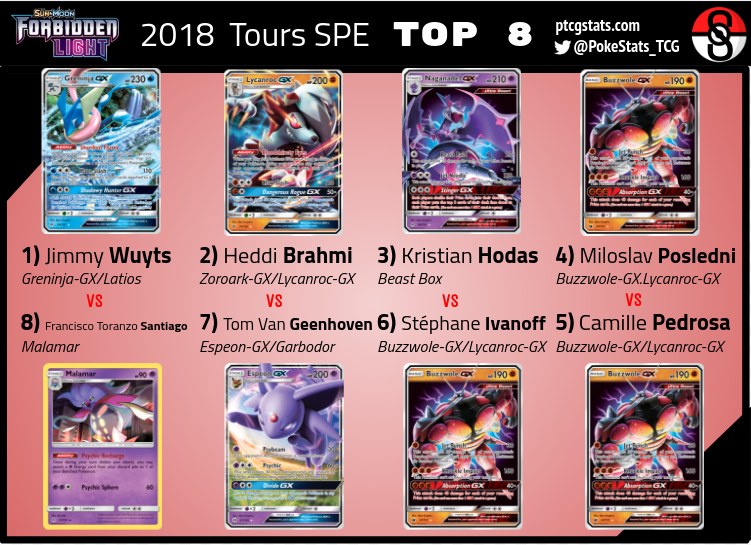 With SM6 Forbidden Light legal for tournament play as of today, this weekend's two Special Events in Tours, France and Mexico City, Mexico, as well as the South African National Championship, will give us the first glimpse into the Standard BRT-FOL metagame. Swiss rounds are underway in Mexico City; with France in an earlier time zone, the Top 8 bracket in Tours has already been decided. 1-seed Jimmy Wuyts surprised with Greninja-GX. This card was often considered inferior to other GX Pokémon in the new set, and was predicted to be paired with Zoroark-GX if it emerged as a metagame contender at all. Wuyts's list contains Latios SHL and may be similar to the list Andrew Mahone featured on his YouTube channel recently. The two other new archetypes in this Top 8 are 3-Kristian Hodas's Beast Box (Naganadel-GX and other Ultra Beasts) and 8-Francisco Toranzo Santiago's Malamar/Ultra Necrozma-GX. Heddi Brahmi is the 2-seed with the sole Zoroark-GX-based deck in cut, and seeds 4-7 are all playing the mighty Buzzwole-GX/Lycanroc-GX, presumably with new inclusions like Beast Ring and Buzzwole FOL. Additional reporting for this post was contributed by Stéphane Ivanoff and Fabien Pujol.